This evening I was in the mood for one of my favorite comfort foods: Whole Wheat Penne with Vodka Cream Sauce. The Vodka sauce is a rendition of Rachel Ray's, "You Won't Be Single For Longa Vodka Sauce." I guess this recipe is one of my favorites since it is also the first meal I ever prepared for my husband. And it confirms the way to a man's heart is through the stomach! Yes, I did share the recipe title with him to confirm my intentions. That night we talked in the kitchen for hours, and realized we both enjoyed cooking and all the fun that goes along with it! Bring a pot of salted water to boil, and add 1/2 a bag of Whole Wheat Penne. I love the Penne for this dish in particular so the swirls can catch the sauce in all the nooks and crevices. Boil until "al dente," approximately 7 minutes on high heat. Check by biting into a piece to make sure it is cooked through, but still retaining a firm texture. While the Penne boils away: Begin by sauteeing one large shallot, and 3 cloves of garlic in 2 Tbsp. of olive oil and 1 Tbsp. of butter over medium heat. (Yes butter....ode to Julia Child....it's all good). Once the the shallots are translucent, add 1 tsp. of crushed red pepper, and 1 cup of Vodka. For the Vodka, I don't measure exactly and I usually pour making 3 whirls around the pan. (Another great measurement I learned from RR). Let the Vodka mixture reduce by half. Next add 1 28 oz. can of diced tomato's and their juices. I just tried a different brand made by Pom and it was terrific. To this add 1 cup of reduced sodium chicken stock and a pinch or 2 of salt. With the lid off, let the tomato sauce come up to a boil, then cover and turn heat down to medium. Let sauce simmer, thicken, and fill your house with an aroma you'll be ready to sink your spoon into! Once the sauce has thickened, add 2 Tbsp. of butter, and 1/4 cup of cream. Keep the heat low, and mix until the butter has melted; cream has blended. You should now have a beautiful, rosy pink sauce. At this point you may opt to add 1/2 cup of parmesan cheese if you are a cheese fan. Last, take a bunch of fresh basil, and prepare a chiffonade to sprinkle on the top. Give it a quick stir, and remove from the heat. 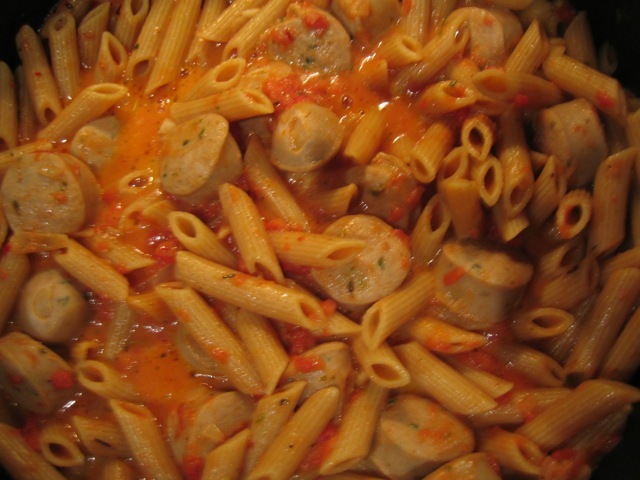 Last, add the Whole Wheat Penne to the sauce, and mix well. Let it "rest." This is one of the keys to producing a hearty texture. You may also choose to add chicken sausage to this dish. If so, add it in prior to mixing the cream, and heat through. This is truly "one pot heaven." And the good news........it's even better as leftovers. Enjoy. ps - If your tastebuds would prefer not cooking with Vodka, you may substitute one cup of chicken broth in it's place. I have done this before on several occasions, and it is just as delicious.